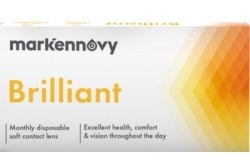 Daily and monthly Gentle 59 contact lenses are made with biocompatible silicone hydrogel. They have high water content adding comfort. These contacts admit high number of radius and diameters. They are perfect for high prescriptions and special measurements. Gentle 59 admits high sphere and cylinder values. For presbyopia patients who have problems in close distance vision multifocal Gentle 59 are the perfect solution. They provide better vision in close distances. In this way, the user’s visual quality is improved, adding better vision and image definition.